If you missed us at NAMM, the North American Music Merchants’ twice-a-year trade show, here’s the scoop. 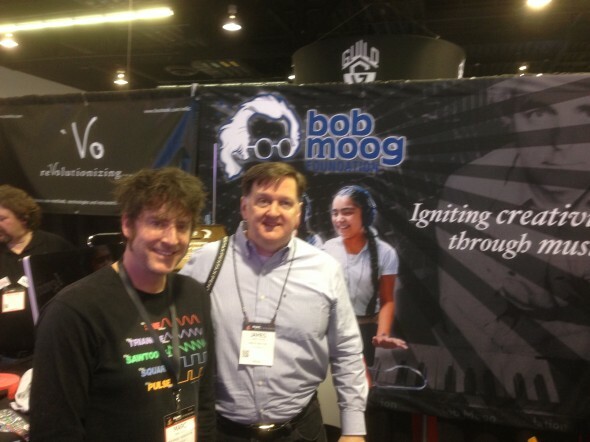 We shared Bob’s legacy by way some special guests: a historic Moog modular, Bode vocoder, and Minimoog controller for attendees to explore, shared with us by top composer and session musician Michael Boddicker. Michael Boddicker and his historic custom, vintage Moog modular. 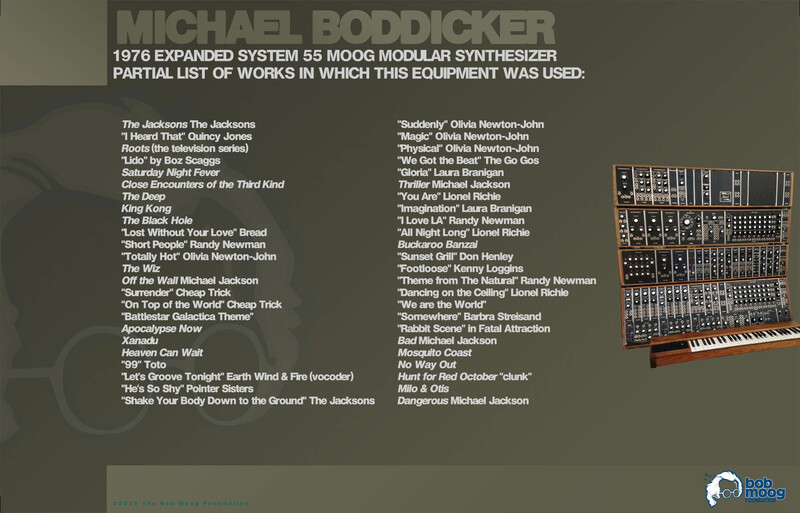 Read more about the history of the Boddicker modular we shared at NAMM here. 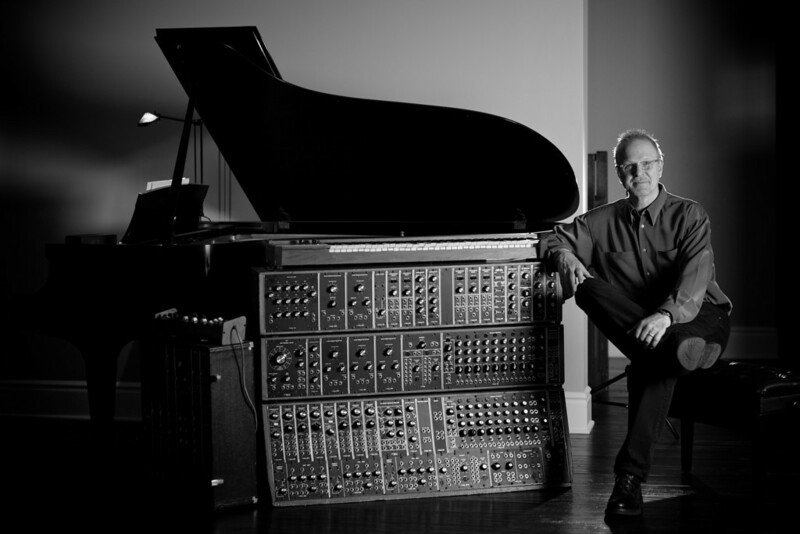 Also the host of our 2014 Ignite Gala in Encino, CA, Boddicker has worked with artists including Lionel Richie, Donna Summer, Quincy Jones, Barbara Streisand, George Benson, Olivia Newton-John, Joe Cocker, and Whitney Houston. A longtime close friend of Bob Moog, Boddicker is also known for his work scoring movies including Flashdance, Buckaroo Banzai, Apocalypse Now, and more. And of course, we welcomed many friends who worked with Bob and his creations to shape electronic music across the decades. 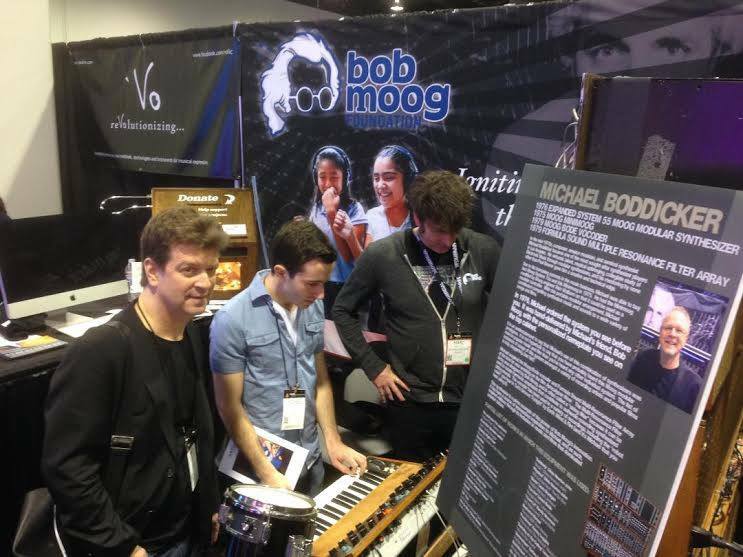 This year honored guests in our booth included Keith Emerson, Stevie Wonder, Yes/Moody Blues keyboardist Patrick Moraz, Gary Numan, TONTO co-creator Malcolm Cecil, Prince keyboardist Morris Hayes, Moog legacy legend Herb Deutsch, and many more. Here are some photo highlights from our annual journey to share Bob’s indelible legacy with the music-makers and innovators of NAMM. 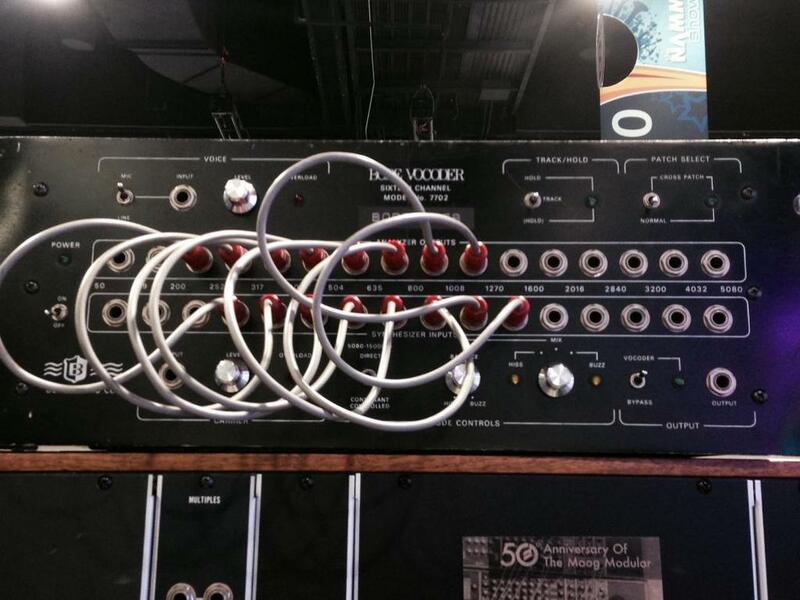 See you next time, Anaheim! 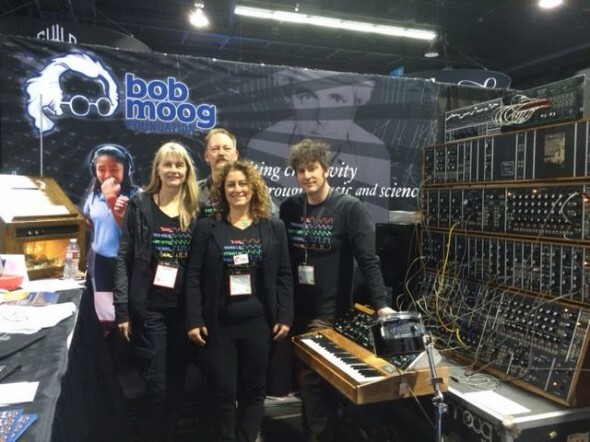 The Waveform Gang: we spent four days at NAMM sharing Bob’s legacy, letting visitors explore Michael Boddicker’s magnificent vintage modular. Our team L-R: rock star volunteers Susan Granados and Scott Kenney, ED Michelle Moog-Koussa, Archive and Education Specialist Marc Doty. 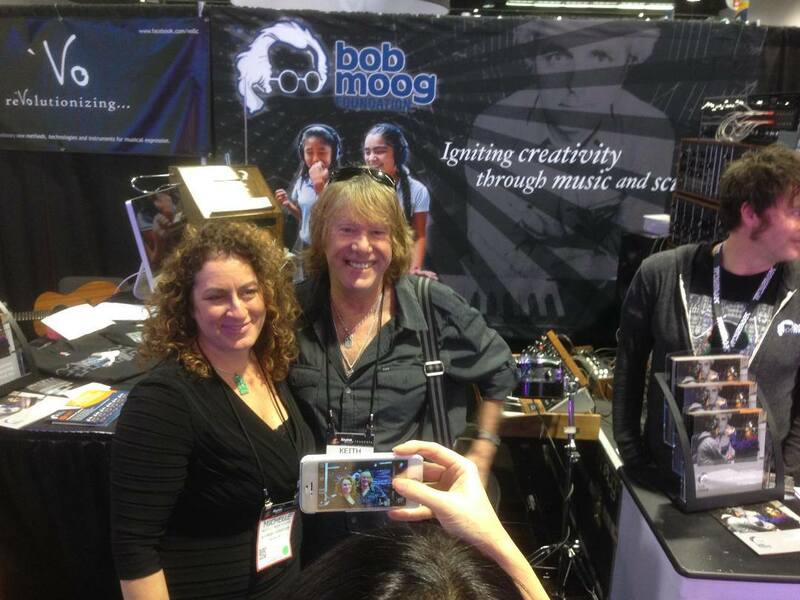 Our executive director Michelle Moog-Koussa with legendary synthesist Keith Emerson. 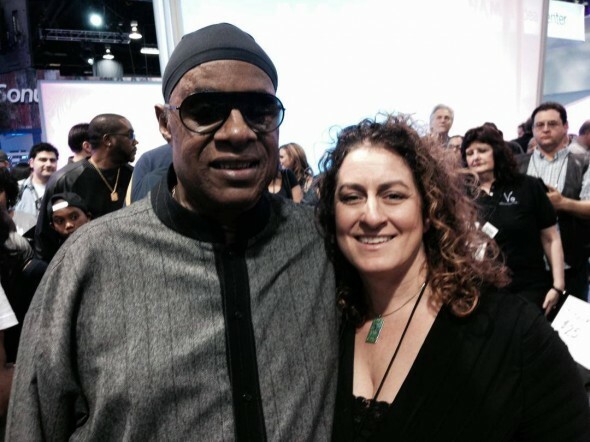 Another living legend, Stevie Wonder, visits Michelle and our booth, 5410. Archive and Education Specialist Marc talks with Stevie Wonder–in front of Michael Boddicker’s magnificent custom, vintage Moog modular. 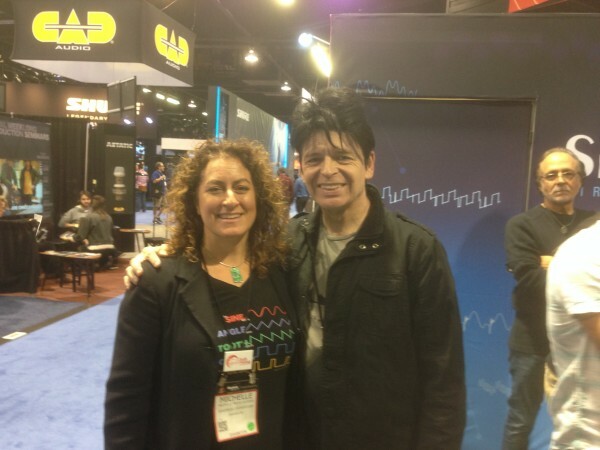 Our ED Michelle with Gary Numan. 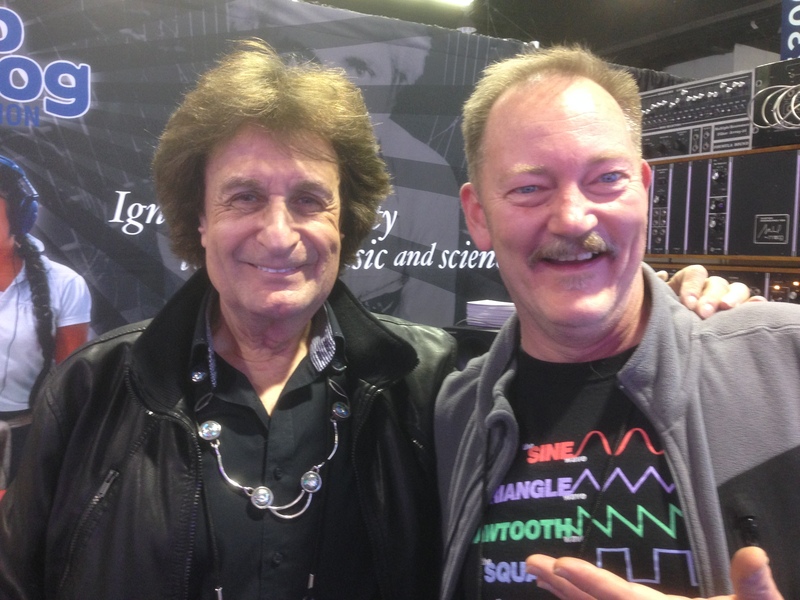 Volunteer Scott Kenney with the magnificent Patrick Moraz. Michelle with Patrick Moraz and his wife, Phyllis Moraz. Top session keyboardist Michael Boddicker with Malcolm Cecil of TONTO’s Expanding Head Band. 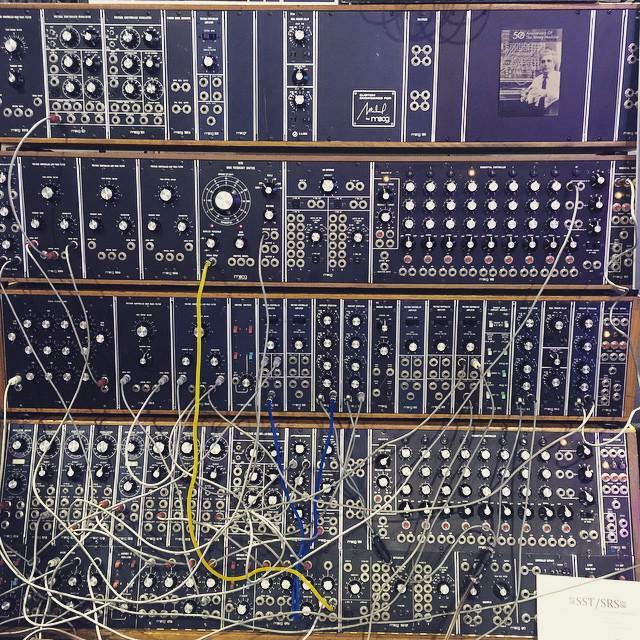 Boddicker’s modular on the far right. Michael Boddicker’s Bode Vocoder, shared with visitors to our booth at NAMM. 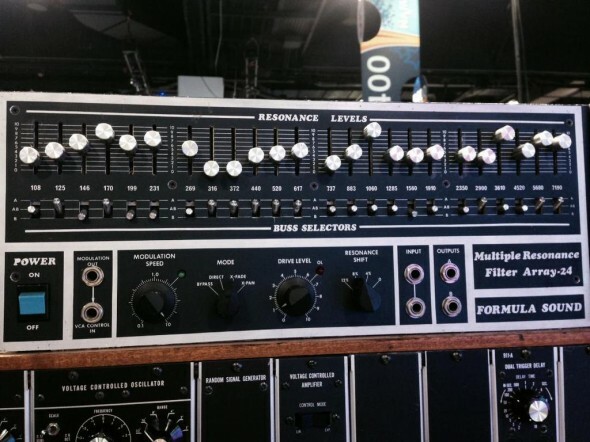 Michael’s Formula Sound Multiple Resonance Filter Array, shared at NAMM. 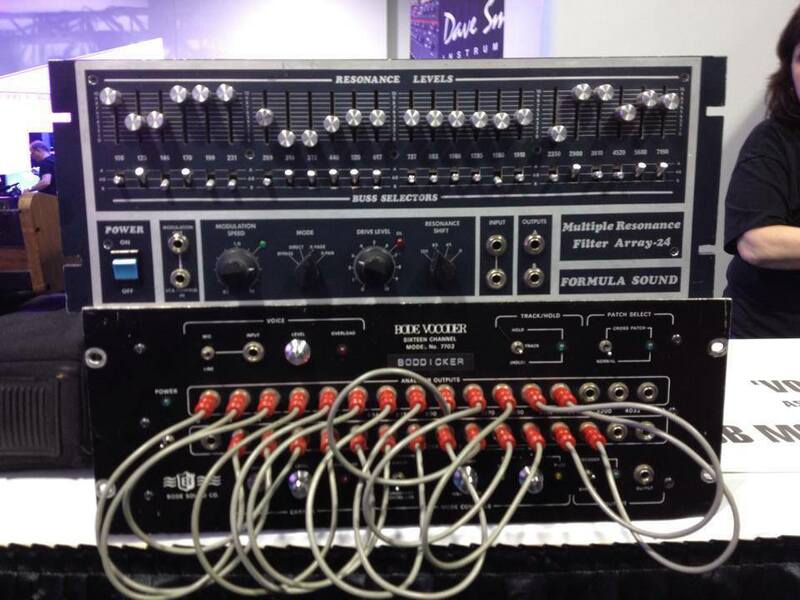 Another shot of the vocoder. Michael’s Minimoog in the foreground. Custom built for Michael Boddicker. 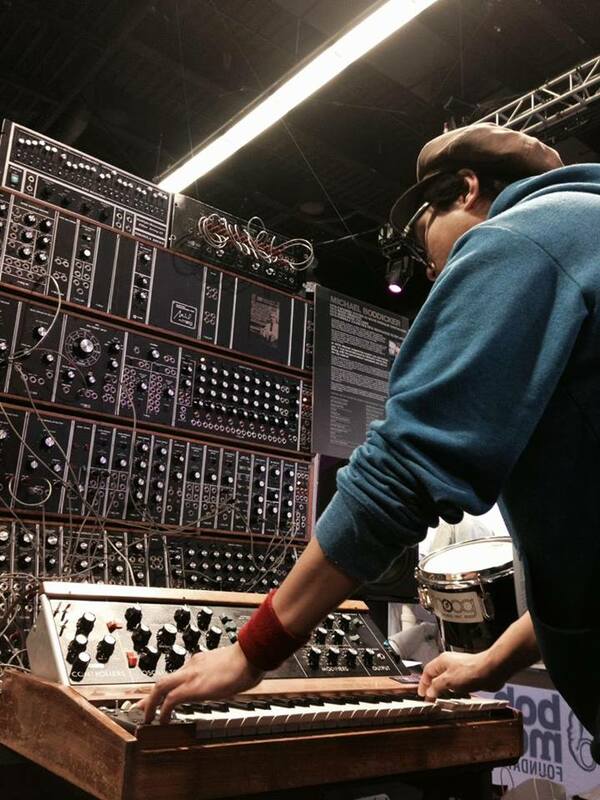 A NAMM attendee controlling the Boddicker Modular with a Minimoog: this is the kind of once-in-a-lifetime experience we offer at NAMM. 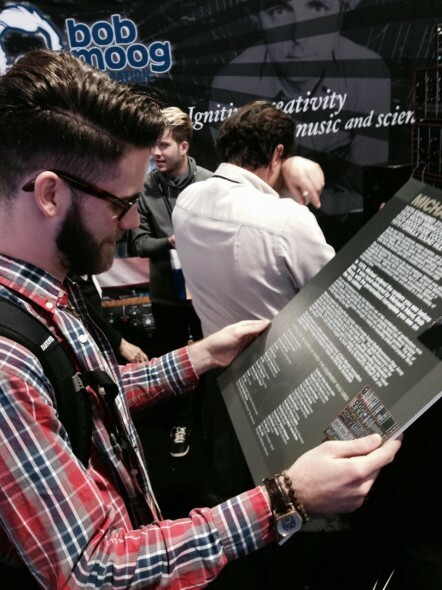 A NAMM student attendee geeks out of Michael Boddicker’s extraordinary resume as a musician and composer. His modular is possibly the most recorded Moog modular in existence. 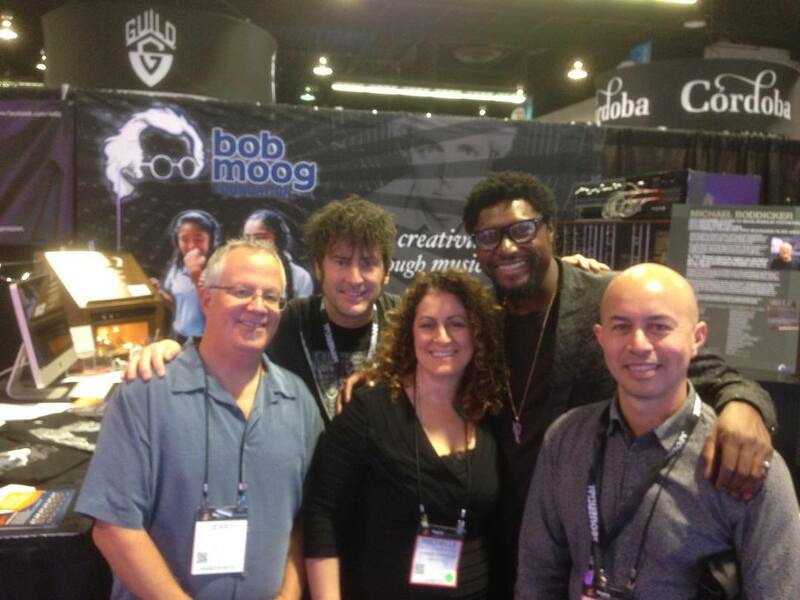 With Morris Hayes, keyboardist for Prince! 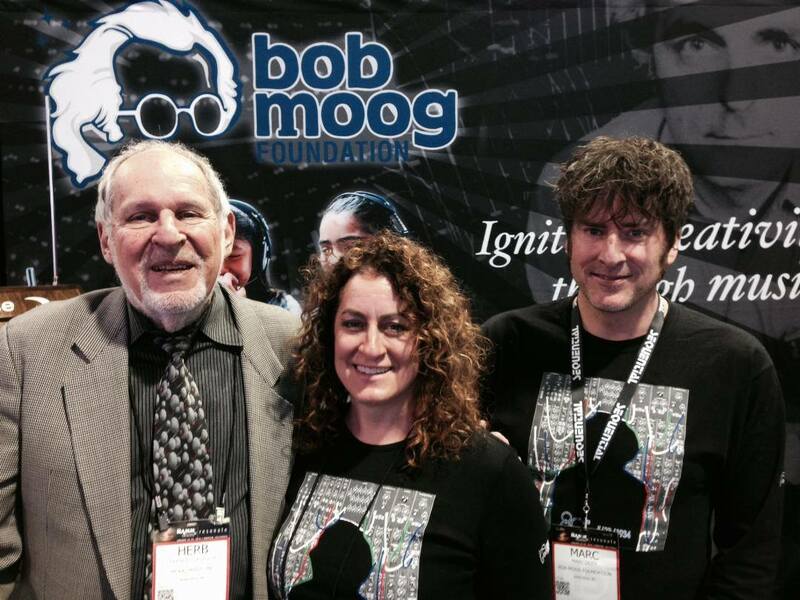 Clockwise from top right: Morris Hayes, Tony Karavidas from Dave Smith Instruments, our director Michelle, board member Jerry Kovarsky, Archive and Education Specialist Marc Doty. 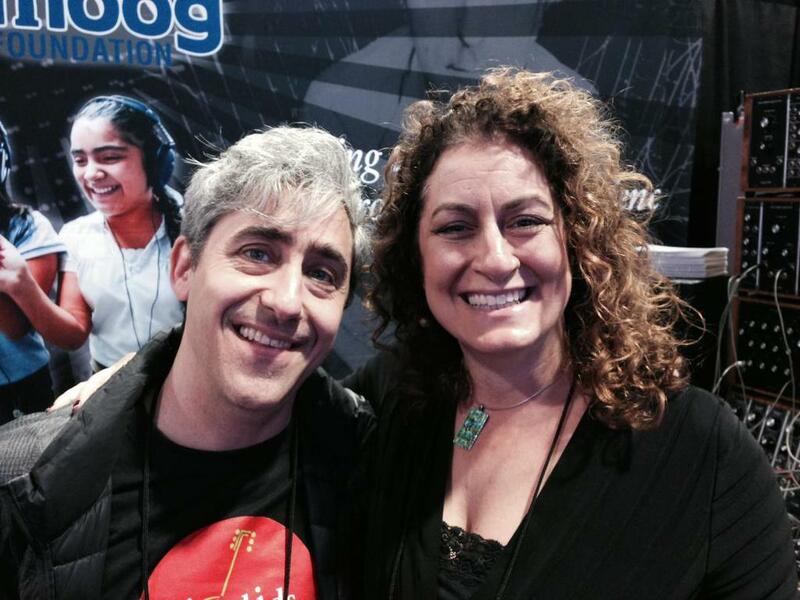 our ED Michelle Moog-Koussa with her colleague David Wish of Little Kids Rock. 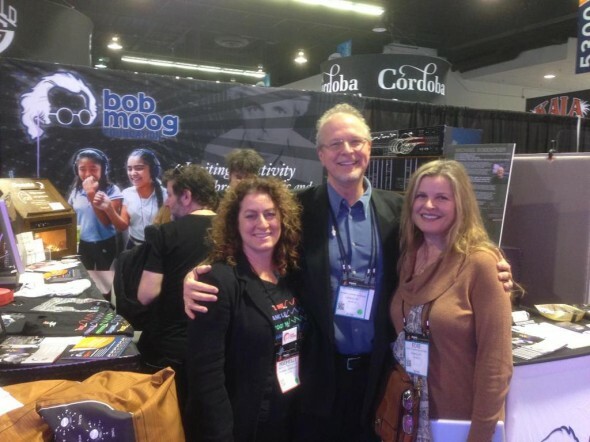 We teach science; Little Kids Rock teaches music. We both offer students life-changing experiences. 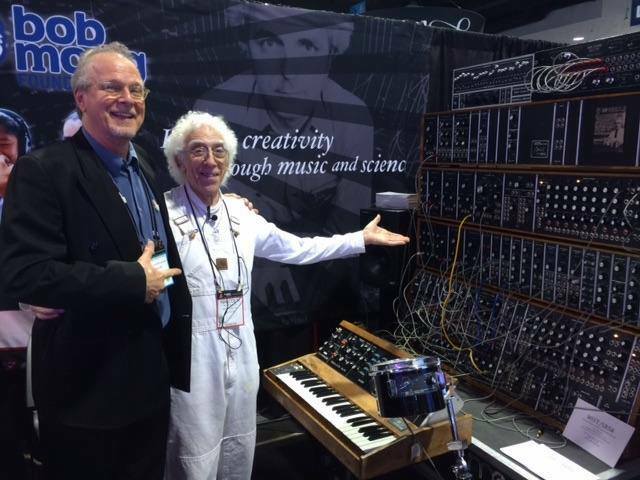 Synthesizer historian Mark Vail with our own Marc Doty. 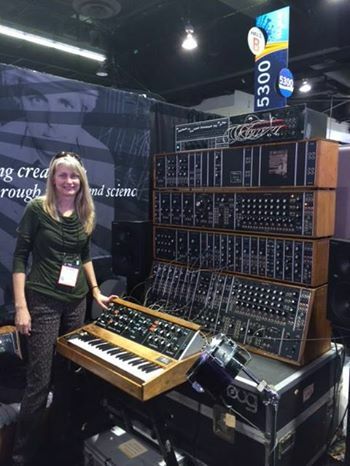 Rock star Foundation volunteer Susan Granados and the Boddicker Modular, as shared by our friends at Keyboard magazine. 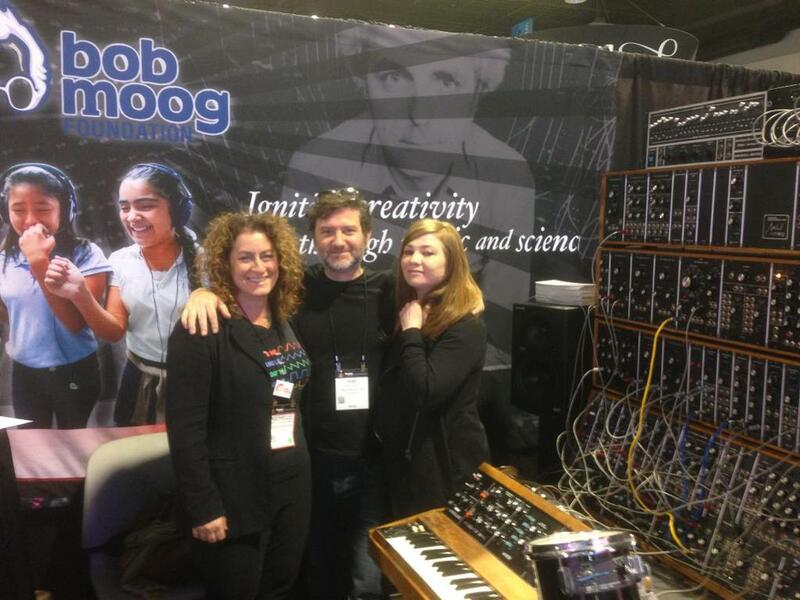 Our ED Michelle Moog-Koussa with Maf Lewis and Tara Busch of I Speak Machine. 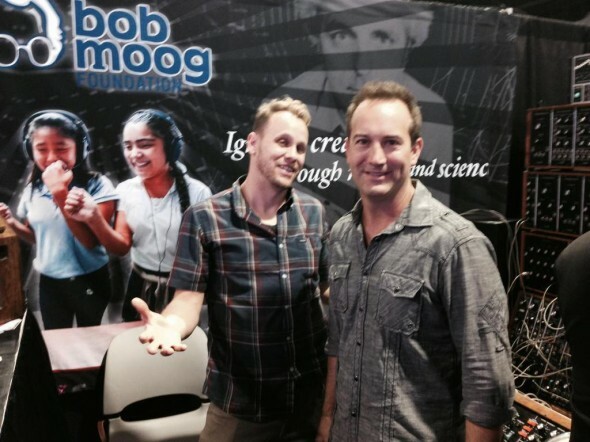 Kris Myer (drums) and Joel Cummins (keyboards) of Umphreys McGee! 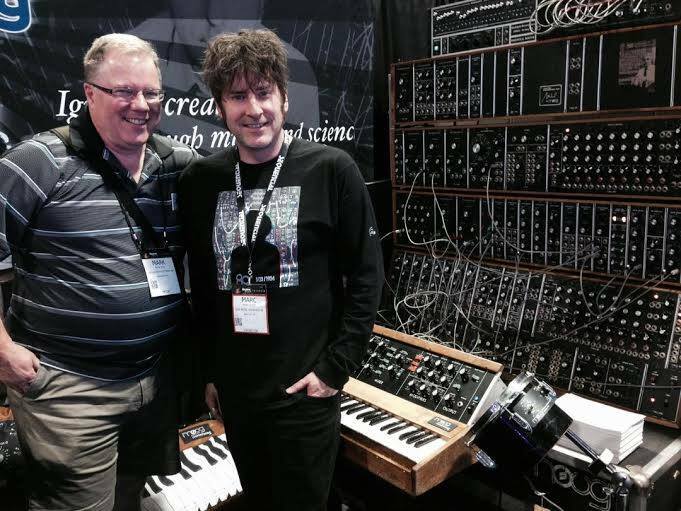 David Rosenthal (keyboardist and music director, Billy Joel) with his protégé Michael Arrom. At 19 years old, Michael has already toured with Steve Vai. 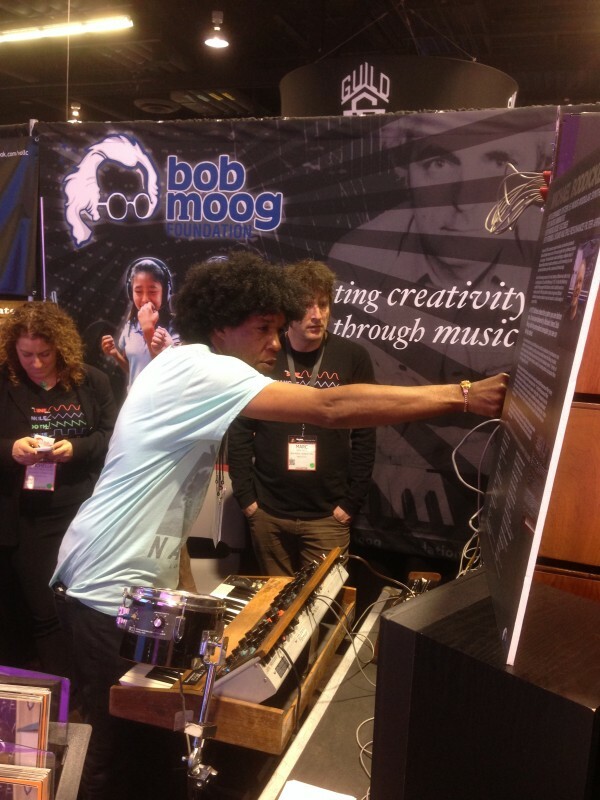 Bob’s legacy is endlessly inspiring the next generation. 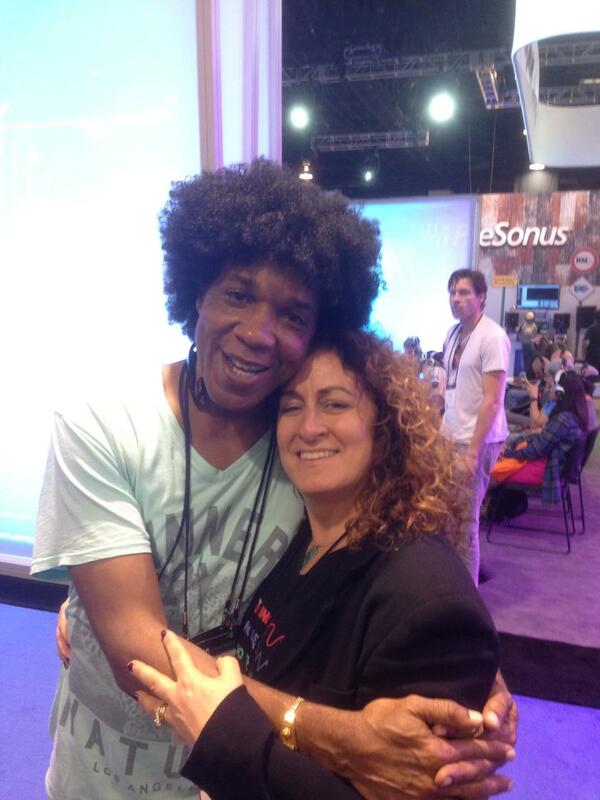 Our ED Michelle Moog-Koussa with programmer/keyboard tech Lamar Mitchell. 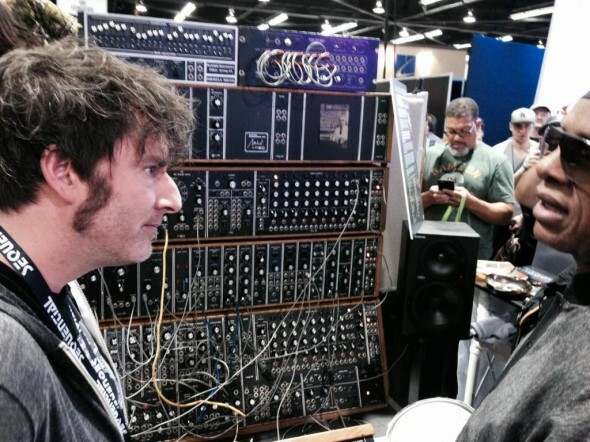 Lamar explores the Boddicker modular with Marc. 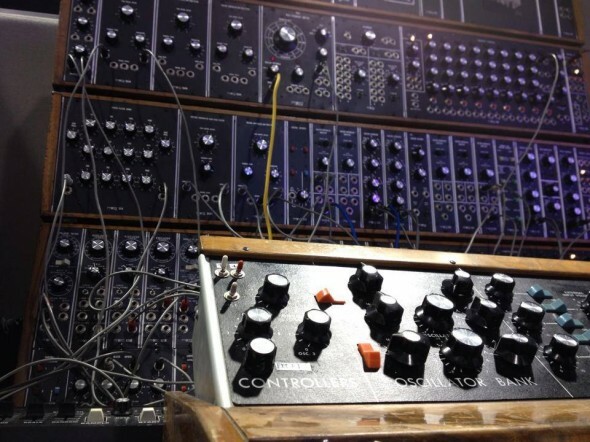 Minimoog controller in the foreground. 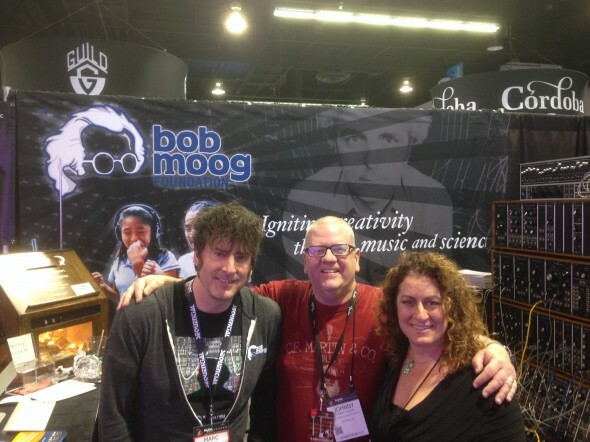 Moog legacy legend at NAMM: Herbert Deutsch with our ED Michelle Moog-Koussa and Archive and Education Specialist Marc Doty. 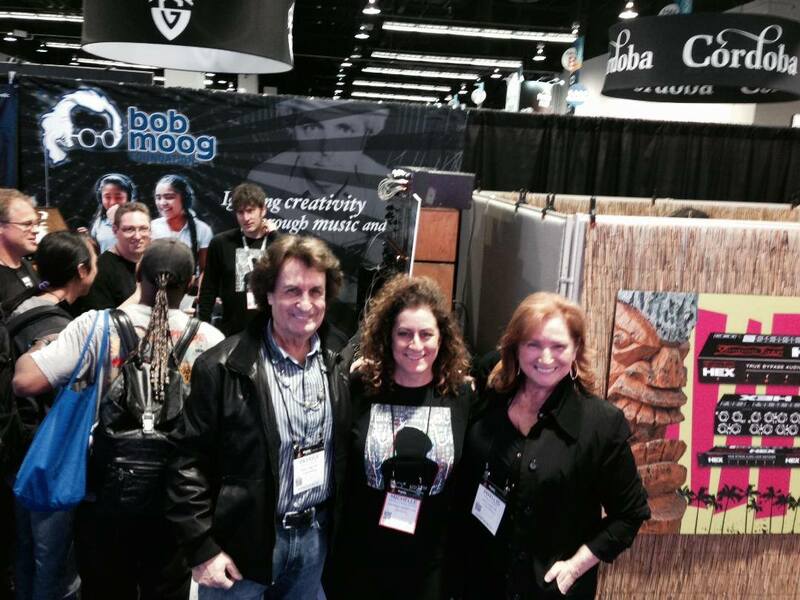 In the back, Bob watches over booth 5410. 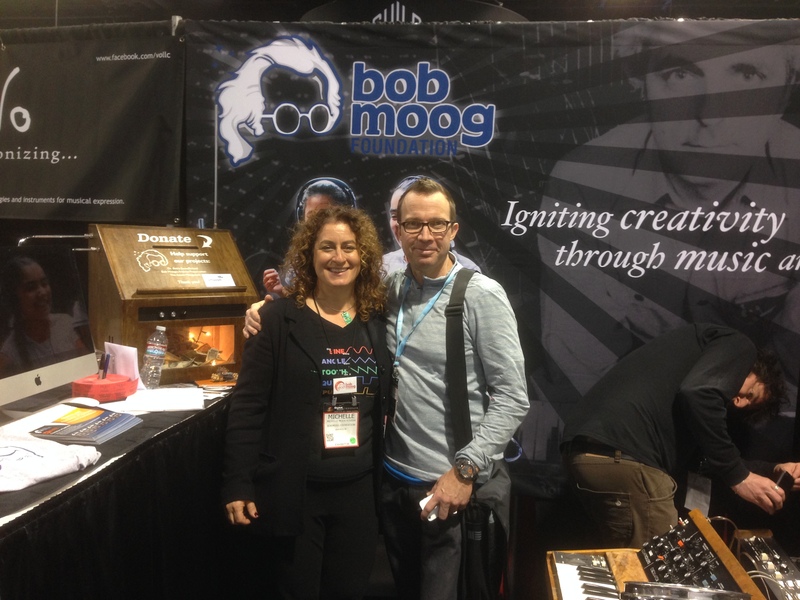 Bob Moog Foundation hero Michael Boddicker (with wife Edie), who loaned the Foundation his vintage modular for us to share at NAMM. A gift for us, and everyone who visited booth 5410.